pictures and pancakes: we're fifty! well, we're not literally fifty. today is our fiftieth post on pictures & pancakes so we thought it was high time we share a delicious recipe for pancakes. most times i believe that simple is better and when it comes to pancakes, nothing beats good ol' fashioned buttermilk. you can get crazy with the toppings but leave the pancakes alone. 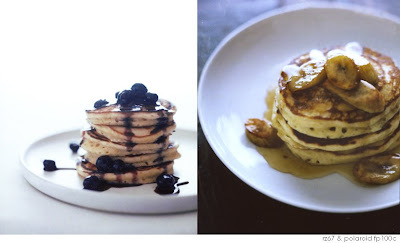 everyone likes them a particular way - i'm a blueberry girl and andrew is a banana pancake guy. i also like to add a little lemon zest to the batter if i'm making the blueberry version. one more tip - do not over mix the batter! it'll be a little lumpy but that's okay. in a large bowl, mix flour, sugar, baking powder and salt. in a separate bowl, combine buttermilk, eggs, butter and vanilla. add wet ingredients to dry ingredients and whisk until just combined. heat griddle over medium high heat and grease. pour 1/4 cup of batter over heat and cook until bubbly around the edges. flip and cook until brown. in a small saucepan, combine maple syrup and 1 cup blueberries. bring to a boil and simmer until blueberries release their juices. remove from heat and stir in remaining blueberries. in a small saucepan, melt butter and add brown sugar. swirl to combine and carefully add sliced bananas in a single layer. cook over medium high heat until they begin to brown on each side. serve over pancakes with maple syrup. My husband recently lost a very special pancake recipe, so special in fact, that he carried it around in his wallet. I think that this will make the perfect replacement and probably be much, much better indeed. Thanks!! You guys always make me want to eat breakfast. Congrats on the fifty entries. That was fast. Happy Fifty! The caramelized bananas sound delicious. congrats on your fiftieth! your beautiful pictures and amazing recipes make this darn 30 day cleanse I keep trying start impossible. keep up the good work! my mouth is watering...I love any kind of banana dessert, and caramelized bananas sound like a version of bananas foster! btw, did you know that february 5 is pancake day? Wow, these pancakes look mouth-watering AMAZING. I have to ask... is it really 2.5 tablespoons of baking powder? ooops, not tablespoons, teaspoons. thanks for catching that! Hey, I'm 50 too! Unfortunately it's years not posts but I love this recipe and the opportunity to celebrate anything 50 with carbs! Keep up the yummy job! just tried this recipe this morning...they were perfect! thanks...and next time I'm trying the blueberry syrup!